Skip and Bobbie's Postkort 1 fra Norge 1998 - Also checkout our TNG Photos Album. Dinner at Odd's home in Oslo. 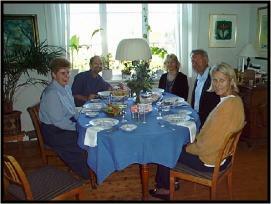 Pictured are Bobbie, Odd Nilsen, Margarete, Jens Rønneberg and his wife Anna. Nina, Jens' sister, describes something to Bobbie. 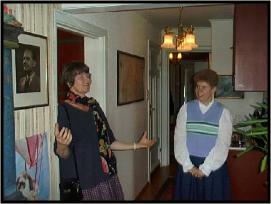 Jens and Anna hosted a mini-reunion at their home in Oslo. Cousins meet for the first time. 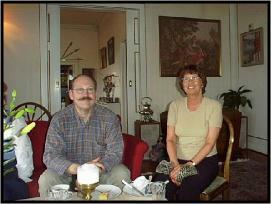 Per and Henny Nygaard at Jens' home for the reunion. This picture is for you Dave Heidemann. 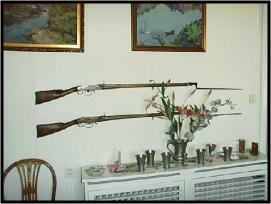 These two Norsk rifles are hanging in Jen's dinning room. They date back to the 1800's. Dave, you would love the antique shops here in Norge.